The impressive Galleria Fountain east of the Delaplaine Arts Center opened in July 2015. Seventy programmable nozzles spray recycled water into the air above a crescent shaped pool, shooting 1,400 gallons of water into the air every minute. The Iron Bridge near the Delaplaine Arts Center and the All Saints Street Parking Garage, was completed in 2006 by Iron Masters LLC. The 250-foot wrought-iron bridge features beautiful iron trees, scrolling plants, flowers, and even the occasional water creature. 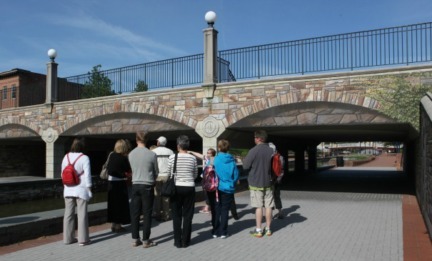 The Community Bridge by the Delaplaine Arts Center began as a plain, concrete traffic bridge. 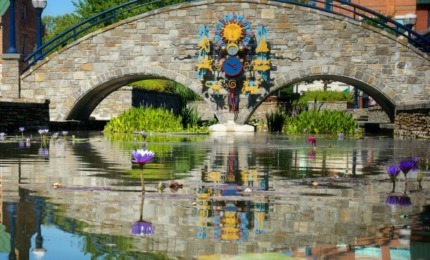 It was transformed into one of Frederick’s most popular pieces of public art by William Cochran and volunteers who used trompel l’oeil painting techniques to paint more than 3,000 faux stones, gates, leaves of ivy, fountains, and more between 1993 and 1998 when the bridge was completed. 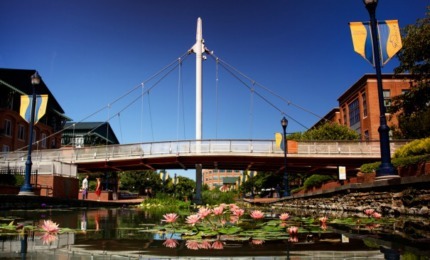 The Pedestrian Bridge is a single-column suspension bridge named for William O. Lee. 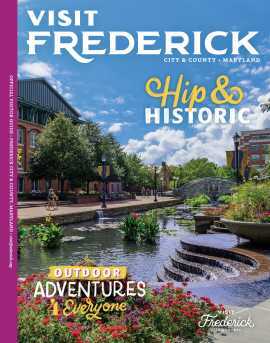 Lee served as school administrator, mentor, historian, City of Frederick alderman, and first chairperson of the African American Resources Cultural and Heritage Society. It was completed in 2006. The Stone Arch Bridge is located near Market Street. 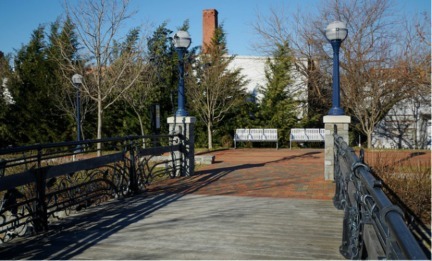 Both functional bridge and public art, it features a Zodiac-themed sculpture with a working clock. The East/West Fountain is located past Market Street across from LaPaz and features beautiful stone work. A replica spring house was built with a tiered waterfall on either side. 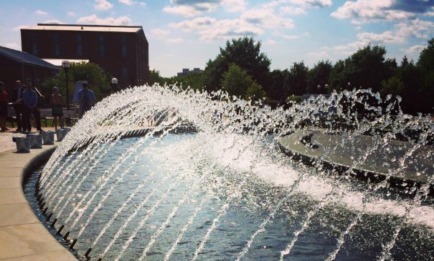 The East/West Fountain opened in September 2015.